Emus (Dromaius novaehollandiae) have three toes. A 15cm long centre toe and sharp nail combined with a powerful forward kick makes for a powerful assault weapon. Emus are flightless but their strong legs make them very fast runners. A sprinting emu can run at 48 kilometres per hour. The word dromaius is Greek for swift-footed. Long, thick, double quilled feathers help the emu maintain constant body temperature (approximately 40°C). In cold weather it fluffs its feathers, trapping air and reducing heat loss (as with an insulating blanket). They have no sweat glands and may lose heat by panting. Emus have no teeth to grind up food so they swallow pebbles into the gizzard and the pebbles grind up the food like a mill. Emu eyes are covered with clear membranes like security blinds to protect them against dust and moisture loss. Deep guttural grunts are made by both sexes; female makes deep drumming noises, most notably during the breeding season. 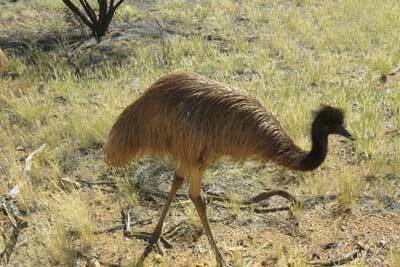 Emus live in semi-arid grasslands and desert woodlands. Emus eat a large variety of native leaves, grasses, fruits and flowers, as well as insects. Dingoes and wedge-tailed eagles prey on emus. The fathers carry the chicks dung away in their beaks and put it a long way away to divert predators. Emu eggs are eaten by reptiles such as goannas and birds such as black-breasted buzzards.Emu has been an important source of protein for desert Aboriginal people. Arrernte men used a plant called imunenge (im-orn-ung-a) (Duboisia hopwoodii) to poison waterholes where emus were known to drink. Hunters would put the crushed up leaves in small waterholes. Emus drinking this water quickly became stupefied, and were easily killed or died close by. Emu eggs are considered to be a delicacy by the Arrernte people of this area and can be eaten raw or cooked. In old times eggs were emptied and used to carry water (kwatye). Emus can stand up to 1.9m and weigh 30 to 45kg, females are slightly larger. They are Australia's largest bird and the second largest in the world. The ostrich is the largest at 2.7m and 156kg. Emus usually breed once a year however in years of drought they may refrain from breeding for one or more consecutive years. The larger female courts the male with a crazy dancing courtship and mates with him. She lays five to 15 large, glossy, dark green eggs at intervals of two to four days on a thin mattress of grass in low bushy vegetation (two females may lay eggs in same nest). The number of eggs laid is dependent upon food resources and body condition. Immediately after laying her clutch the female leaves her nest (never to return) to feed and recover her strength. She often mates with another male. Meanwhile, the male incubates the eggs. He sits continuously during the eight weeks leaving the eggs only rarely and eating little. He may lose up to a third of his body weight during this time, living off extensive fat reserves (built up to twice normal levels before breeding season) and dew on the grass around him. He may not even defecate over the eight weeks. The eggs hatch over a period of about four days and the male leads the chicks around and broods them beneath his feathers at night for about one month. The young feed themselves, and stay with the dad seven to eight months. Young have camouflage stripes for three months but don’t reach full height for another nine months. Ratites (emu, cassowary, ostrich, rhea and kiwi) are likely to have evolved in Gondwanaland, probably from a flying ancestor. Australia separated 55 million years from rest of Gondwana. The word ratite (from the Latin ratis) means rafts and refers to the fact that their breastbone has no keel and it is the keel that is needed to anchor the powerful flight muscles.